The president also met with NRA officials last weekend. President Donald Trump and Vice President Mike Pence met with National Rifle Association officials Thursday night at the White House -- the second time in less than a week that he's had such a meeting. "Good (Great) meeting in the Oval Office tonight with the NRA!" the president tweeted. Following the meeting, NRA executive director Chris Cox tweeted, "I had a great meeting tonight with @realDonaldTrump & @VP. We all want safe schools, mental health reform and to keep guns away from dangerous people. POTUS & VPOTUS support the Second Amendment, support strong due process and don’t want gun control. #NRA #MAGA." 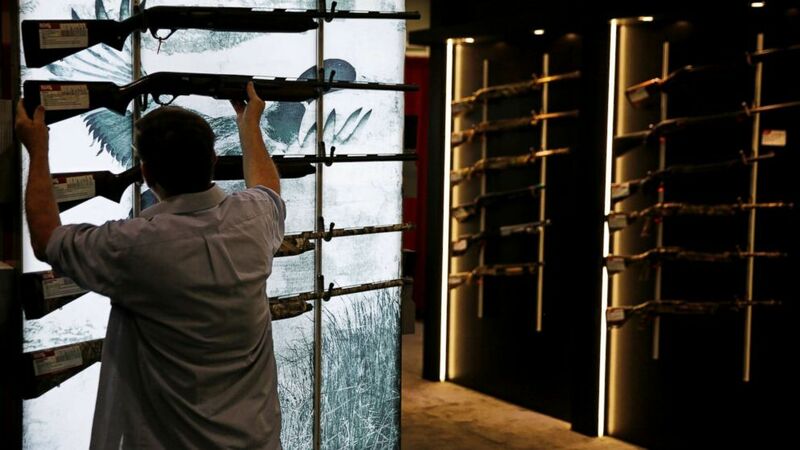 (AP Photo/David Goldman) A man looks at a gun on display at the NRA annual convention where President Donald Trump is scheduled to speak later in the day in Atlanta, Friday, April 28, 2017. Trump had a lunch meeting with NRA leaders last Sunday -- including Cox and NRA CEO Wayne LaPierre -- and during a gathering of governors on Monday, he told the lawmakers to not be "afraid" of the group. "Don't worry about the NRA, they're on our side," Trump said. "Half of you are so afraid of the NRA. There's nothing to be afraid of. ... And you know what, if they're not with you, we have to fight them every once in a while, that's OK. Sometimes we're going to have to be very tough and we're going to have to fight 'em."